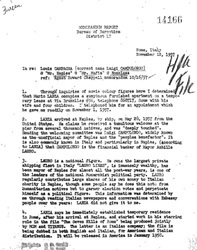 Letters, papers, programs, musical scores—visible memories—document Mario Lanza's life, his Italian roots, his place in the history of a city and the hearts of his fans. 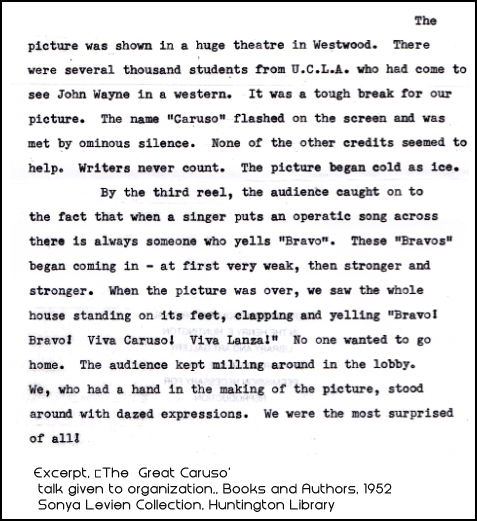 And unexpected sources shed light on the fiction and fables of stardom. The Great Caruso changed the way generations felt about opera. Some who would later become great tenors—e.g. 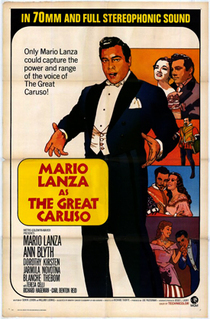 José Carreras, Plácido Domingo, Luciano Pavarotti, Roberto Alagna, and Joseph Calleja—have said that Mario Lanza's performance in the film propelled them towards an operatic career. 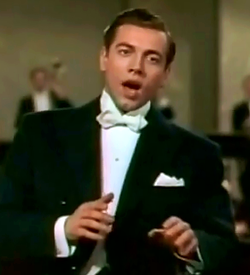 But Bobbysoxers, high school and college students also flocked to the The Great Caruso and left theaters with "La Donna è Mobile," "Celeste Aida," "Vesti la Giubba," "La Danza"—any and all of 27 dazzling musical numbers in the movie—ringing in their heads. 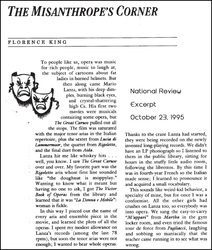 Excited and moved by the power of the human voice—Mario Lanza's voice—their eyes opened to the beauty of operatic music. 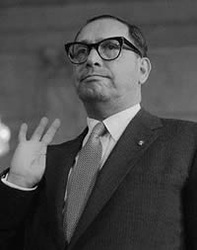 Tasked with attacking organized crime, the U.S. Bureau of Narcotics intensified investigations into racketeering, drug trafficking, and tax evasion of known or suspected Mafia members during the Cold War years. 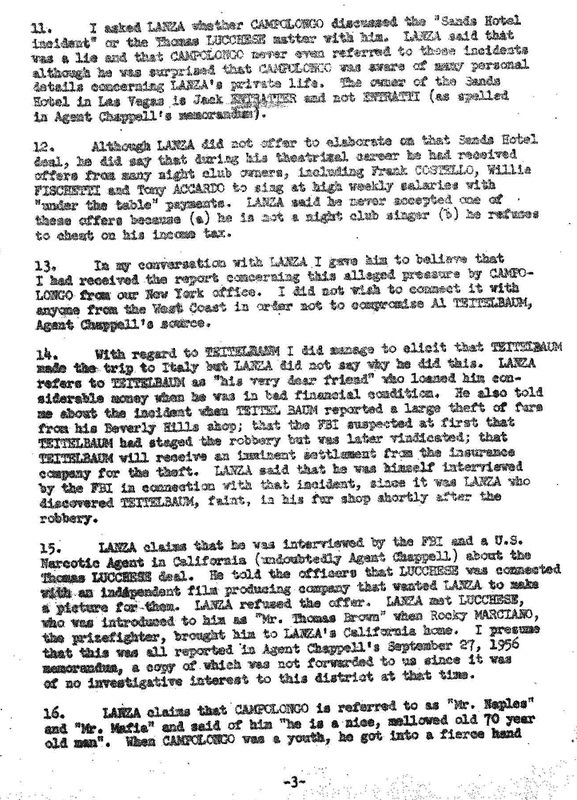 In 1956 and 1957, reports from Al Teitelbaum (1915-2011), Lanza's one-time manager, led Bureau agents to interview Mario Lanza concerning attempts of known Mafioso to muscle into his career. 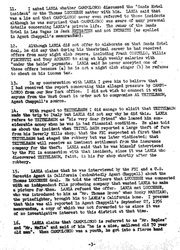 At the time, Teitelbaum was climbing the legal chain appealing his conviction for insurance fraud, a process exhausted in March 1959 when the U.S. Supreme Court dismissed a final appeal and denied certiorari. 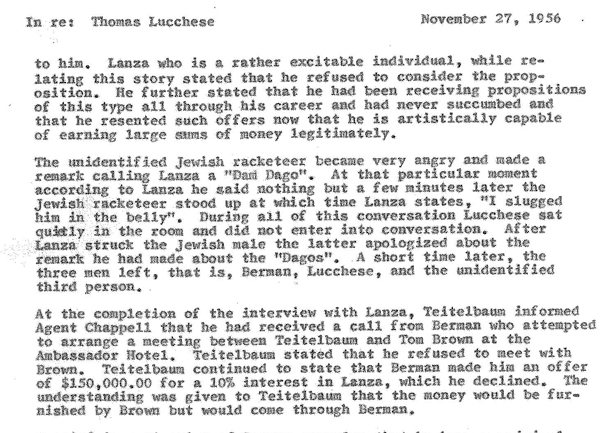 On the basis of information from Al Teitelbaum, Bureau agents interviewed Lanza in 1956 about an visit to his home from Tommy "Three Fingers" Lucchese and an offer that required no second thoughts to refuse. 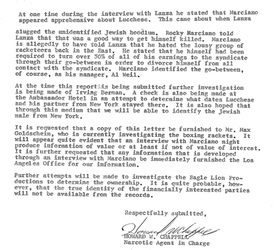 The diminutive (5' 2") Lucchese, master of criminal intrigue within the Mafia, headed New York's Gagliano family. 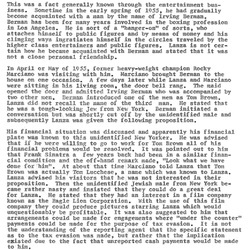 An astute businessman, his eye fell on lucrative possibilities, legal and illegal, on the West coast. 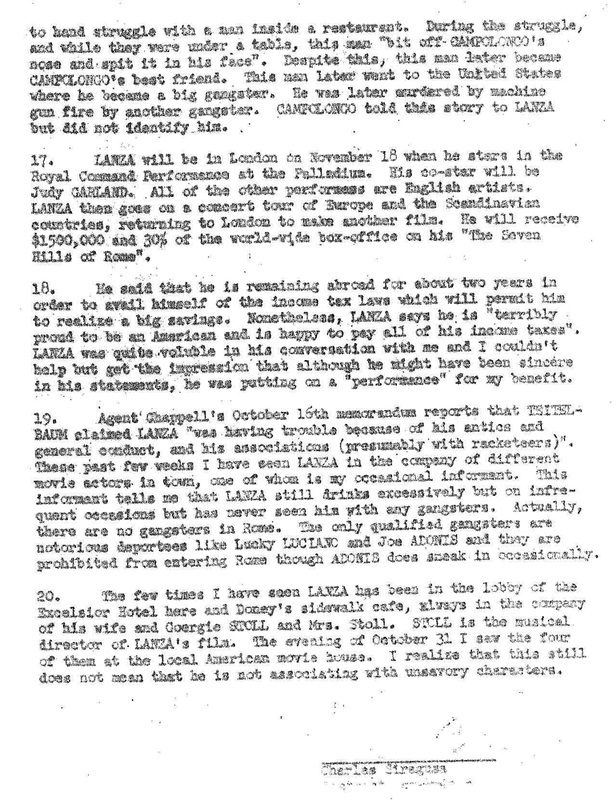 Lucchese spoke not a word during the meeting, but men in his entourage offered Lanza movie and singing deals with under-the-table payments. 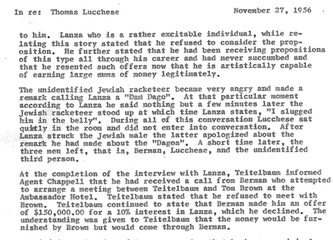 Lanza's rejection was unequivocal. 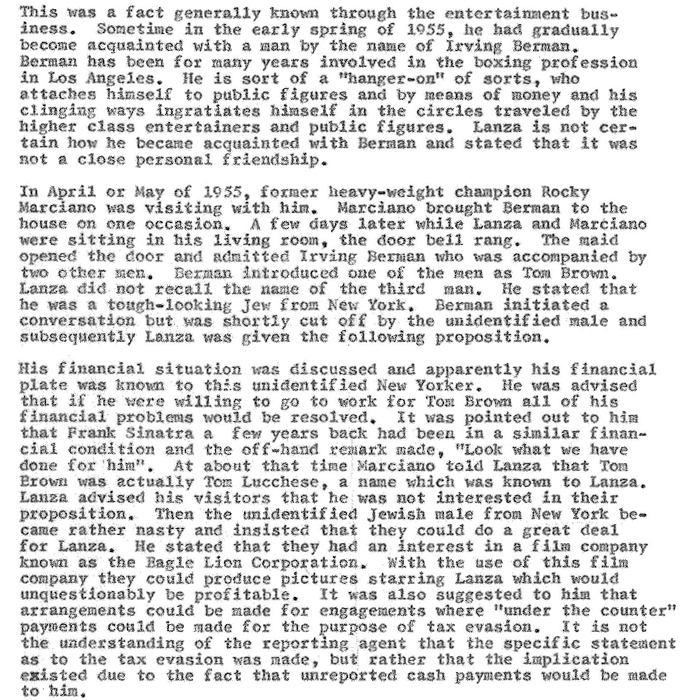 Much to the concern of his friend, Rocky Marciano, who was also present, the tenor delivered a crushing stomach blow to a Lucchese mouthpiece who had referred to him as a "Dam [sic] Dago." 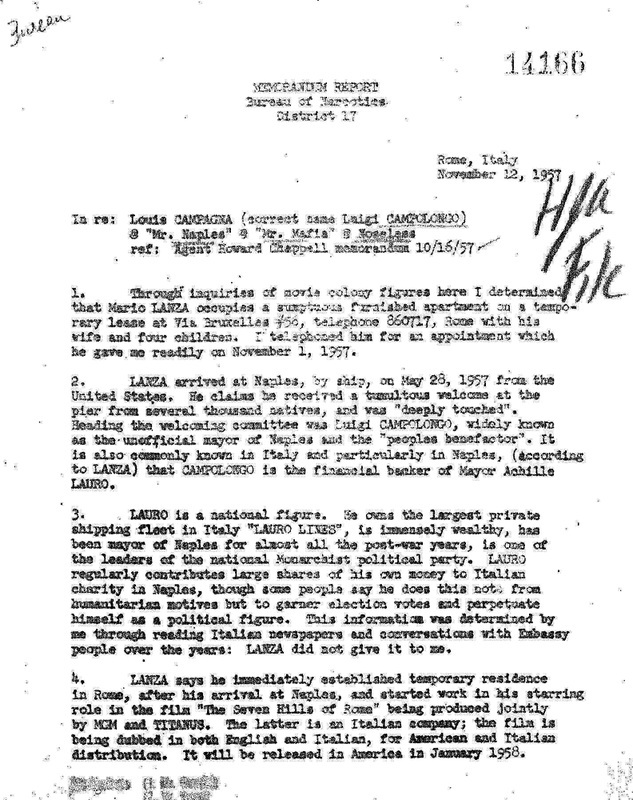 In November 1957, Bureau agents again interviewed Lanza in Italy. 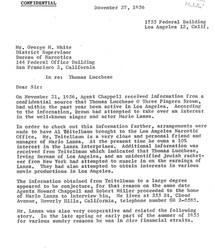 They chose not to tell the tenor that reports from his former manager had prompted their investigation "in order not to compromise Al Teitelbaum, [their] source." 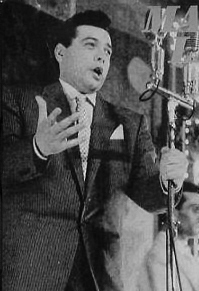 Teitelbaum had visited Lanza in Rome in mid-1957 (shortly before terminating his contract as the tenor's manager) on the set of Lanza's sixth film, Seven Hills of Rome. 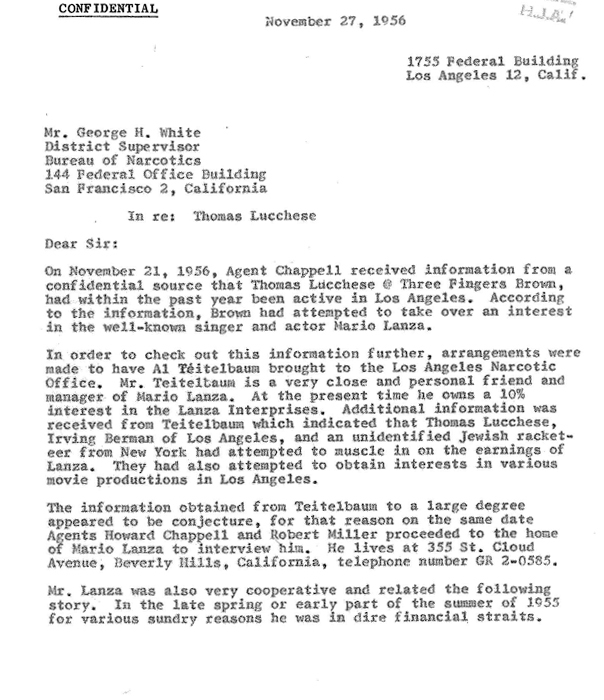 He told the Bureau that the tenor "was having trouble because of his antics and general conduct, and his associations (presumably with racketeers)." 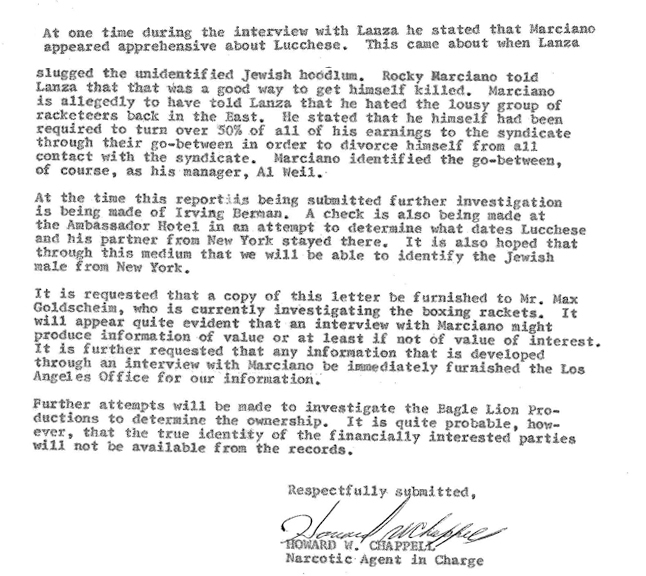 After observing Lanza in Rome and talking to him, agents found no evidence substantiating Teitelbaum's reports. 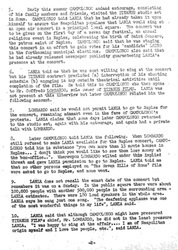 Bureau agents further failed to establish hidden connections between Lanza and the Mafia. 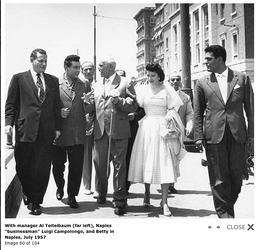 On July 14, 1957, Lanza interrupted filming to appear in Naples to receive the Enrico Caruso Award from Enrico Caruso, Jr. at a large open air event marking the start of the Feast of San Gennaro. Caruso had personally prevailed upon him to attend, and the tenor was also to become an honorary citizen of Naples. Lanza discovered, however, that the occasion was a pretense for a political rally organized by Luigi Campolongo, aka "Mr. Mafia" and "Mr. Naples" to build electoral support for the current mayor of Naples, a Campolongo man. 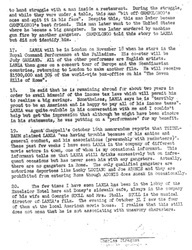 Studio heads had initially refused to release Lanza, whose contract precluded his accepting other engagements during filming, but Campolongo then issued a veiled threat: "You own more than 15 movie houses in Naples . . . I don't think you would like to see them lose money . . .". He thereby ensured Lanza's presence. 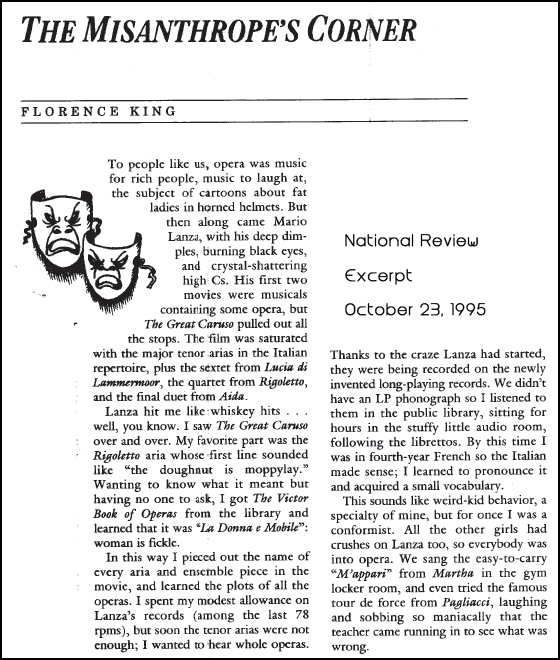 Uncomfortable with these behind-the-scenes machinations, Lanza nonetheless considered the Naples performance thrilling. 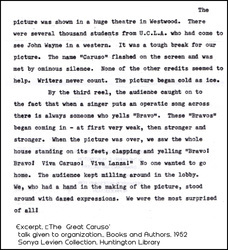 After receiving the Enrico Caruso award, he sang just one song to the thunderous approval of an audience of more than half a million in the Piazza della Sanità. 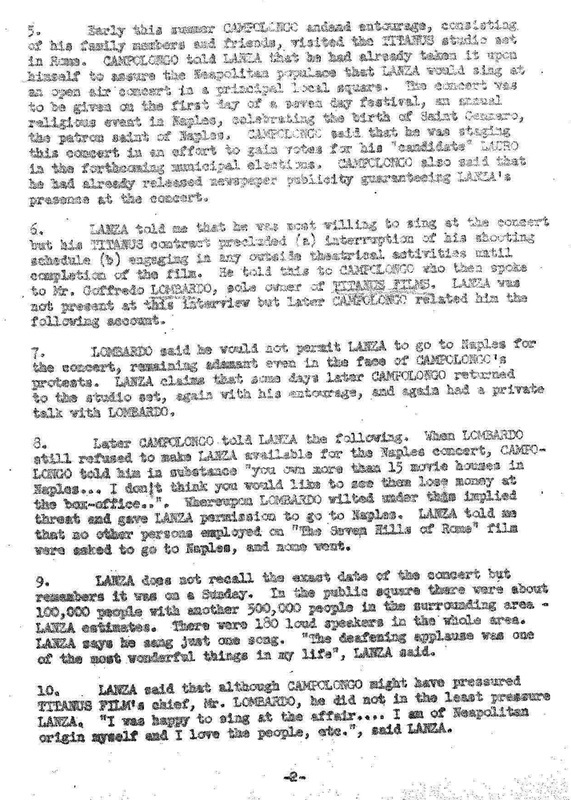 "The deafening applause was one of the most wonderful things in my life," Lanza told Bureau agents. 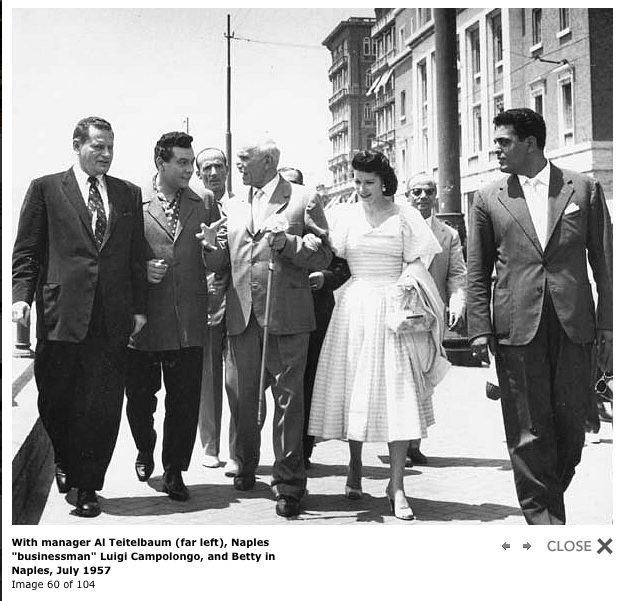 Film footage posted to YouTube, directed by Gino Campolongo, shows Mario and Betty Lanza in Napoli that day, the people he was with, and historic views of the city and its people.